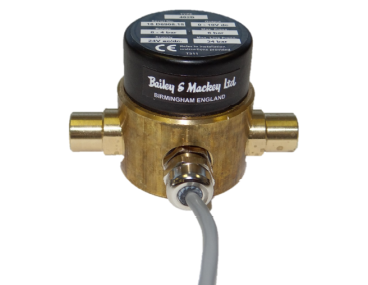 Bailey & Mackey’s range of Pressure Switches is built to the highest standards of workmanship required for such precision devices. 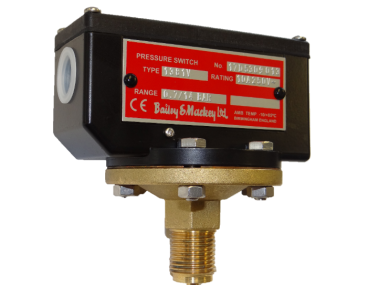 Each individual Pressure Switch is subject to a series of stringent pressure and calibration tests before despatch. We have the capability of designing bespoke switches for the majority of pressure applications and have the tools and equipment to design instruments to withstand pressure up to 700 bar. Developed in close co-operation with end-users the Bailey & Mackey range of pressure transducers is designed for a wide variety of industrial applications. Units can be supplied with cooling coil transmitters for use with hot liquids or gases; 50mm pipe flange, for mounting on pipes carrying slurry or powder and full chemical seals, for applications where a corrosive pressure medium is present. The Maximum pressure range for our Transducers is 600 bar. Bailey & Mackey’s ranges of Bourdon, Diaphragm & Differential Pressure Gauges are high precision instruments suited to a diverse spectrum of industrial users. Manufactured to the highest standards under an exacting quality control regime, they perform with unerring reliability over a long lifetime. 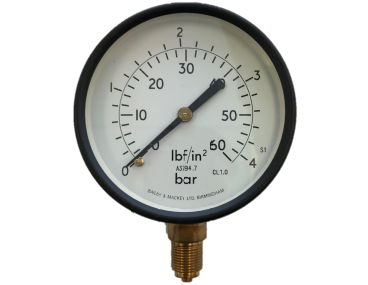 We Manufacture Gauges with up to 150mm faces and to withstand up to 700 bar of pressure. Bailey & Mackey Ltd is used to handling pressure: in fact, it is its business. Founded in 1946 and based in Hamstead on the fringe of West Bromwich in the Black Country we make instruments for monitoring and controlling pressure. With a product range that is based on a solid engineered design Bailey & Mackey has received recognition throughout the world for supplying robust and reliable products. Bailey & Mackey has always ensured that it meets all required quality standards: more recently the BS EN 9001:2015 Quality Management System accreditation was attained, we also hold approvals from LPCB for products supplied into the fire industry and are fully prepared to work on joint projects with customers to achieve specialist approvals. The Bailey & Mackey Internal Technical Sales team working closely alongside our R&D team ensures that as a company we are constantly looking at not only improving our existing product range but also that we are liaising with our existing customers to develop new products or tailoring existing designs to meet their applications, flexibility is the key to the Bailey & Mackey philosophy. We continue to invest in the latest CNC machinery to ensure our parts are manufactured to the highest quality whilst maintaining cost efficient manufacturing. With thousands of parts being manufactured every day, we have a dedicated quality team to ensure all components and completed units are manufactured to the required standard. This alongside our experienced team of staff and supervisors means that Bailey & Mackey continues to manufacture the highest standard of equipment. In more recent years the export market is where we see our key to growth, already strong in certain industries in countries such as the Middle East, Sweden and China. We see potential in overseas markets for all our products and future development.